Temporomandibular disorder (TMD) is a painful problem of the joint in the jaw. These are the small joints in front of each ear. They attach the lower jaw to the skull. TMD may be in the joint in the jaw or the muscles around it. Rest the jaw by eating soft foods. Limit movement with smaller bites. Do not open your mouth too wide. Apply ice or heat packs to help with the pain. Do gentle jaw stretching and exercises. A splint or mouth guard can be made to relax the jaw muscles and prevent the teeth from clenching and grinding. The guard is usually worn at night. Unfortunately, there is not a lot of proof it works. Correction of bite abnormalities by a dentist or orthodontist may be needed. Surgery is a last resort. Many of the current surgeries have not been well-studied. There is no way to prevent TMD. Borodic GE, Acquadro MA. The use of botulinum toxin for the treatment of chronic facial pain. J Pain. 2002;3(1):21-27. Haley DP, Schiffman EL, Lindgren BR, Anderson Q, Andreasen K. The relationship between clinical and MRI findings in patients with unilateral temporomandibular joint pain. J Am Dent Assoc. 2001;132(4):476-481. Temporomandibular joint (TMJ) dysfunction . EBSCO DynaMed Plus website. Available at: https://www.dynamed.com/topics/dmp~AN~T114703/Temporomandibular-disorders . Updated February 20, 2018. Accessed July 12, 2018. TMJ. American Academy of Otolaryngology—Head and Neck Surgery website. Available at: http://www.entnet.org/content/tmj. Updated July 13, 2018. Accessed July 13, 2018. TMJ. American Dental Association Mouth Healthy website. Available at: http://www.mouthhealthy.org/en/az-topics/t/tmj. Accessed July 13, 2018. 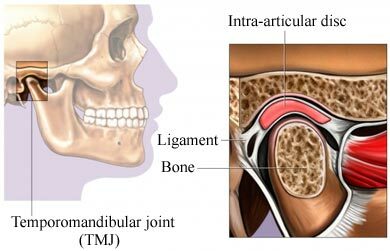 TMJ (temporomandibular joint and muscle disorders). National Institute of Dental and Craniofacial Research website. Available at: http://www.nidcr.nih.gov/OralHealth/Topics/TMJ. Updated February 2018. Accessed July 13, 2018. Temporomandibular disorders. American Association of Oral and Maxillofacial Surgeons website. Available at: https://www.aaoms.org/docs/practice%5Fresources/clinical%5Fresources/tmd%5Fdisorders.pdf. Published 2017. Accessed July 13, 2018. DynaMed's Systematic Literature Surveillance http://www.ebscohost.com/dynamed: Turner JA, Mancl L, Aaron LA. Short- and long-term efficacy of brief cognitive-behavioral therapy for patients with chronic temporomandibular disorder pain: a randomized, controlled trial Pain. 2006;121(3):171-172.